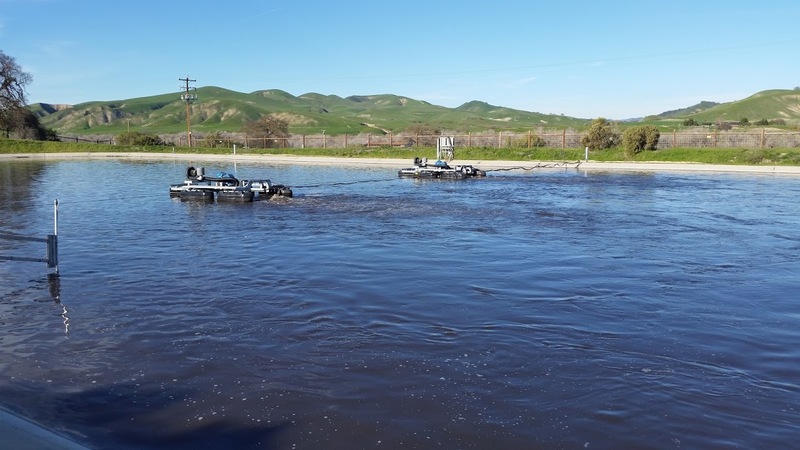 A winery in California (USA) faced the challenge of optimizing and treating their wastewater pond in a sustainable manner. The winery had brush rotors frequently breaking down, which were very difficult and time consuming to repair. They were seeking a more reliable option. Aeration Industries International provided that solution in more ways than one. Crush season is an extremely demanding time for everyone at the winery. This high demand translates directly to the treatment of the wastewater as well. Flows and loading of the treatment system are not only high, but can fluctuate considerably as well. It’s obvious to most how the mechanical reliability can help keep this under control. What’s less obvious, is how the treatment reliability can prevent those incredibly undesirable and distracting wastewater emergencies from happening at all. Moreover, the long term capacity of the treatment systems can have big financial impacts when looking towards expansion. It could be the difference between expanding the treatment system to match the production, or simply modifying the existing infrastructure to optimize its efficiency. Aeration Industries International worked with the vineyard to provide more reliable equipment, but also a design to provide greater treatment efficiency. The efficiency improvements were gained by creating a more robust biological environment with greater contact and retention through a unique combination of oxygen and mixing with the Aire-O2 Triton. To demonstrate the gain in treatment reliability, Aeration Industries and the facility’s management worked together during the crush season to assess the performance of the wastewater pond. Performance was assessed based on wastewater sampling results obtained at the influent and effluent points in the pond of interest. During the time of crush an average of 18% higher organic load was received in the wastewater pond than its original design. Even with this and a few other unexpected challenges, the new treatment system provided consistent waste removal throughout the critical crush period with greater than 90% removal on average. This was a 10% increase in efficiency overall and removed significant swings compared to 5 years of average performance from the old equipment. Eliminating the surprise emergencies during the demanding crush period is an important short term gain from the reliability of Aire-O2 products and designs. For the long term vision of the wineries, much more will be gained with flexibility to significantly change the production capacity without significant investment into the wastewater treatment system. The information and conclusions drawn from this study are only the tip of the iceberg. Aeration Industries International will continue to partner with the vineyard to improve the performance of their treatment system. We will continue to dive deeper into understanding the symbiotic relationship shared between the biological system and the Aire-O2 Triton, and how it benefits our partners across the wine industry. View the full Case Study in English or Spanish.